Best wishes to everyone for a great holiday and Christmas break. All the best for a great 2019. There will not be an article for the next few weeks. The Varsity Boys had a great week that started off with a 79-51 win, in league play, over WH Croxford. 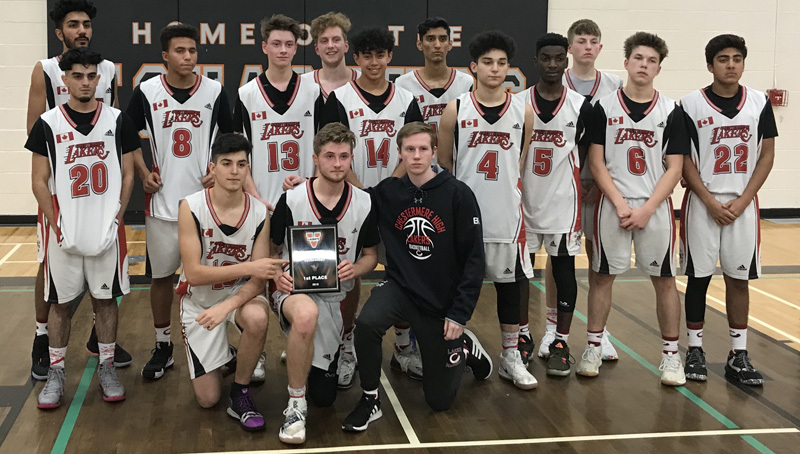 The Lakers then headed north to Edmonton to participate in the Thom Elniski Memorial tournament hosted by ME Lazerte, where the Lakers topped Lillian Osbourne 77-61 and J Percy Page 84-51 on route to a matchup with Spruce Grove in the finals. The Lakers won that matchup 88-64 to win the tournament. Jaxon Kolesar-Lafaut, Tyrone Gray and Malek Meddeb all had great performance on the weekend. The Lakers host the Springbank Phoenix this week and then head into the Christmas break. The Varsity Girls basketball team had a busy week. They travelled to Airdrie to play W.H. Croxford in league play. It was a defensive battle for most of the game, but the Cavaliers prevailed. 45-36. Jenna Merhi led all Lakers with 10 points. On Thursday, the Lakers played in the Bert Church Invitational tournament. In their first game, they matched up once again with Notre Dame. In a defensive battle Notre Dame eked out a 37-36 victory. Kiah Isbister was named player of the game. On Friday, Chestermere met W. H. Croxford. Again, it was a defensive battle, with Croxford winning 48-40. Hanna Merhi was named player of the game. In their final game, the Lakers took on Holy Trinity from Edmonton. Chestermere was able to get contributions from every player and it showed with their best game of the year and a 57-36 win. Shaelynn Doughty was named player of the game. The Lakers continue to improve every day and every game, and travel to Springbank on Wednesday night, for a league game. The JV girls basketball team went into Wednesday’s league game, against W.H. Croxford, with high hopes, but, unfortunately, couldn’t come out with a win. They headed off to Medicine Hat on Friday to compete in an invitational tournament and came away with 3 hard fought losses and 1 deserving win. The girls travel to Springbank this Wednesday to finish off 2018 with what the team hopes to be a win! Player of the week is Harjot Rai. The annual Football Awards Night took place on Monday, December 10th. About 80 people shared in a nice meal prepared by the Culinary Arts Department. A special tribute was given to parents, Si Currey and Elisa Hides, for their contribution to the program the past few years. Special presentations were also made to the coaches and managers. Chestermere was well represented in the 2018 The Rocky View Football League Awards. Cody Currey was a recipient of the Coaches Award with Blair Rota and Kalum Konschuh being named to the all-star team. As well two team members were recipients of major awards. 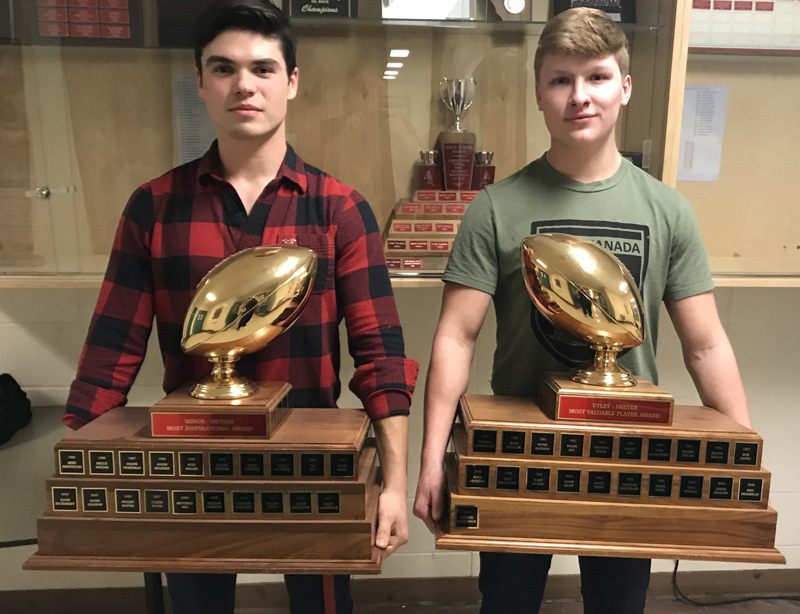 Roy Outh was named the outstanding running back for the league, while Dakota Konschuh was selected outstanding receiver. UTLEY-DEETER MOST OUTSTANDING PLAYER-DAKOTA KONSCHUH, MINOR-MEYERS MOST INSPIRATIONAL-ADON ALEXANDER. Congratulations to these two outstanding young men. There will be some major announcements in the new year regarding the CHS Athletic Field Upgrade. Anyone wishing a sponsorship package just send me an email and I will forward it to you.